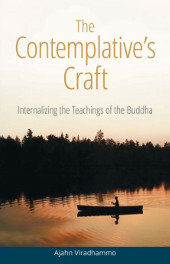 To commemorate Ajahn Viradhammo’s 70th birthday on April 27th, the electronic edition of his upcoming book of Dhamma reflections entitled The Contemplative’s Craft: Internalizing the Teachings of the Buddha, will be made available on April 27th through a number of different websites. These websites include forestsangha.org and the forest monastery websites of Tisarana, Amaravati, Abhayagiri, and Temple Forest. The print edition of Ajahn Viradhammo’s book will be published in the fall of 2017, and offered for free distribution through Forest Sangha Publications. Ajahn V turns 70 on the 27th of April! Celebrations for his birthday have been scheduled for Saturday 29th April. There will be a pot luck Dana followed by a meditation sit & Dhamma Talk given by Ajahn V. If you are bringing any food for the potluck, please arrive at Tisarana by 10.30 AMat the latest. The meal will be offered by 11.15 and the sit will commence at 1.30 PM as usual. We have also planned the Vesak Celebrations to be held on Saturday May 13th. As with the birthday celebrations, there will be a pot luck Dana followed by a meditation sit & Dhamma Talk. If you are bringing any food for the potluck, please arrive at Tisarana by 10.30 AM at the latest. The meal will be offered by 11.15 and the sit will commence at 1.30 PM.